THE ROAD TO KHALISTAN: Good-bye, Brother Laibar Singh! Such a beautiful, full beard! I admit this has me in tears. I, who never cry, seem to be spending a lot of time in tears these days.. Am I getting old and emotional or what? I'm posting a few pictures, in random order, that will take us back through this case. I have been an avid supporter of Brother Laibar's case and, in fact, consider him my brother, no less than the seven outrageous men I grew up with. I am devastated - temporarily - that my contact with him is currently in India and I have no way to personally tell him Good-bye. He has enriched me in ways I will make no attempt to explain. I am profoundly hurt and disappointed by my country's lack of compassion for this unfortunate brother. The fact that, as near as we can tell, tomorrow, 4 November, is the twenty-fourth anniversary of the shaheedi of my family doesn't help. I feel a heavy weight on me today. Hold on here...Chardi kala kicks in and I know that through the sadness and pain I mustn't permit myself to be dragged down into a morass of depression. Sadness, yes, pain, yes, but pull myself up, no, wait, let my ego step aside, so Guru Papa Ji Maharaj can and will pull me back up. I remind myself, oh, yes, that's right, this is all the Hukam of Vaheguru. So I put a smile on my face and love in my heart and wish Brother Laibar peace, joy and good health, as well as the joy of reunion with his children. Dear Brother, I ask that now and again you think of those of us in Canada and other countries, too, who have loved and supported you. Remember this strange older sister who has loved you and kept you in her prayers - and who will continue this, as long as she lives. For those of you in Vancouver, he is supposed to be at the airport, I read, at 8:00 PM. It would be nice if some showed up to wish him a good flight and a safe and happy life back home. This is not meant, I suppose, as a protest, just a final chance to show our love and support. 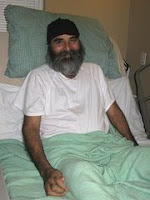 Updated: November 03, 2008 3:22 PM Laibar Singh, the paralyzed refugee claimant who sought shelter in an Abbot sford Sikh temple, was expected to return to India early tomorrow morning (Tuesday). 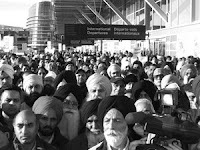 Singh was to leave the Sahib Kalgidhar Darbar Gurdwara Monday to present himself to Canada Border Services Agency (CBSA) by 8 p.m. at the Vancouver International Airport, said temple president Swarn Singh Gill. His flight to New Delhi was scheduled to leave at 1 a.m., said Gill. Some supporters from the temple were to accompany Singh to the airport, but no protesters planned to block his departure, said Gill. “There will be no demonstration because he’s the one who wants to go back now,” he said. More than 1,000 supporters at the airport prevented his deportation in December 2007 after his first five-month stay at the temple. Singh returned to the Abbotsford gurdwara in March after a stay at Surrey’s Guru Nanak Sikh Temple. Singh was feeli ng somewhat despondent, said Gill. Singh’s lawyer, Peter Edelmann, confirmed his client intended to present himself at the airport for removal, in a statement released yesterday. 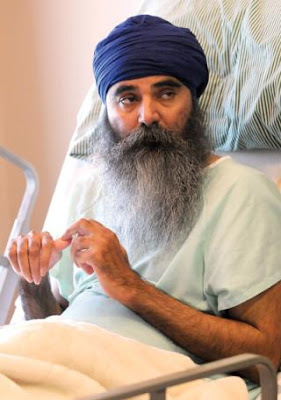 CBSA officials talked to Singh’s doctor about whether the paralyzed man was fit to make the trip to India, Edelmann said. 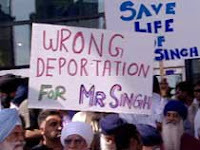 Agents from the border services agency attended the Abbotsford gurdwara, despite the clear indication it was a sanctuary zone, to tell Mr. Singh that there was no chance for him to remain in Canada, stated Edelmann. Singh hoped to remain in Canada on humanitarian grounds but the 49-year-old tired of his struggle. He originally came to Canada in 2003 on a forged passport and made a refugee claim, saying he faced persecution at the hands of Punjab state police. His claim was denied and he fled Ontario to B.C., where, working in Surrey as a painter in August 2006, he suffered a brain aneurysm that left him paralyzed. The Sikh community has raised a total of $38,000 to help Singh cover costs once he returns to his village in the Punjab, said Gill. Beyond that, he will be returning to India with a couple of suitcases and two specialized wheelchairs. Gill talked to Singh’s eldest daughter Sunday night, who had mixed emotions about her dad’s return to India. CBSA officials said it would be inappropriate to comment any further on Singh’s case. Here is an article I like because it tells the story, while preserving his dignity. 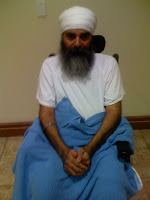 VANCOUV ER (NEWS1130) - The paralyzed man who sought sanctuary in a Sikh temple in Abbotsford is heading home. Last month Laibar Singh made the decision to head back to India and sources say he'll be put on a plane tonight. His story came to light when he became paralyzed due to an infection after he entered Canada illegally. Every attempt to claim refugee status was denied. Canada Immigration wanted him sent back to India but supporters rallied around him fearing he wouldn't get the proper medical treatment in his home country. He's been in the temple for over a year and says the main reason for leaving is because he misses his children. A less dignified article that contains more in formation from the Winnipeg Sun is here.